Sony has announced the launch of its new nav-u personal navigation devices – NV-U73T (4.3″) and (4.8″) NV-U83T, offering (TTS) Text-To-Speech voice commands, an intuitive color display and real-time traffic reports, allowing users to travel with confidence. Pre-Loaded Maps and Content – Comes pre-loaded with Map Content covering the entire United States, Canada, and Puerto Rico. Enjoy powerful, portable navigation out of the box! Dual-View-3D Junction Guide – Dual View capability displays dynamic route information, in addition to the conventional map view, to provide an even clearer view of what’s around the bend or in a highway merge scenario, which Junction to take. Gesture Command – With a touch-screen comes control via simple, on-screen finger movements. Commonly used commands such as ‘take me home’ may be accessed by gesturing an inverted ‘V’ on the screen versus paging through numerous menu screens. RDS-TMC Traffic Messaging Channel – Step away from standard GPS mapping and towards a more complete navigation solution. Real Time Traffic Information radio reception allows the devices to constantly monitor relevant traffic conditions and automatically re-route you around trouble spots! Bluetooth Handsfree Communication – Using integrated Bluetooth wireless technology, focus on the road ahead instead of your phone. By pairing your Bluetooth-enabled phone to your Nav-U portable satellite navigation system you can make and receive calls on the go. Position Plus – Even if GPS signals are temporarily interrupted, such as when driving in a tunnel, the Nav-U NV-U83T will keep you on-track. Position Plus uses multiple sensors to monitor your position relative to the map, so you can continue without worry of losing your way. 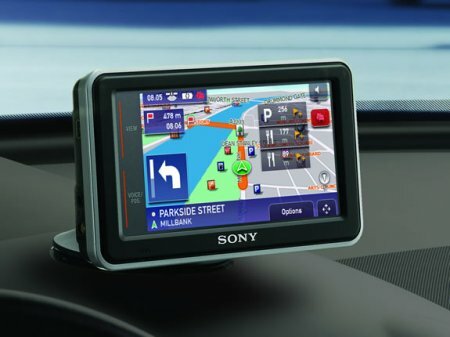 The new Sony NV-U73T and NV-U83T personal navigation systems are available now for about $300 and $400, respectively.